The paper folds itself into a crane that can move and fly for ten minutes. The spell ends when the crane takes damage or is unfolded. 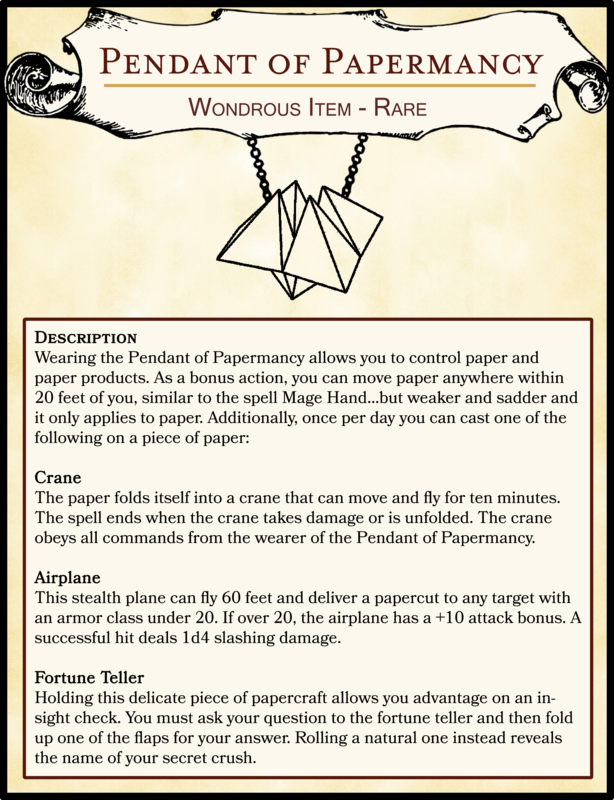 The crane obeys all commands from the wearer of the Pendant of Papermancy. This stealth plane can fly 60 feet and deliver a papercut to any target with an armor class under 20. If over 20, the airplane has a +10 attack bonus. A successful hit deals 1d4 slashing damage. Holding this delicate piece of papercraft allows you advantage on an insight check. You must ask your question to the fortune teller and then fold up one of the flaps for your answer. Rolling a natural one instead reveals the name of your secret crush.